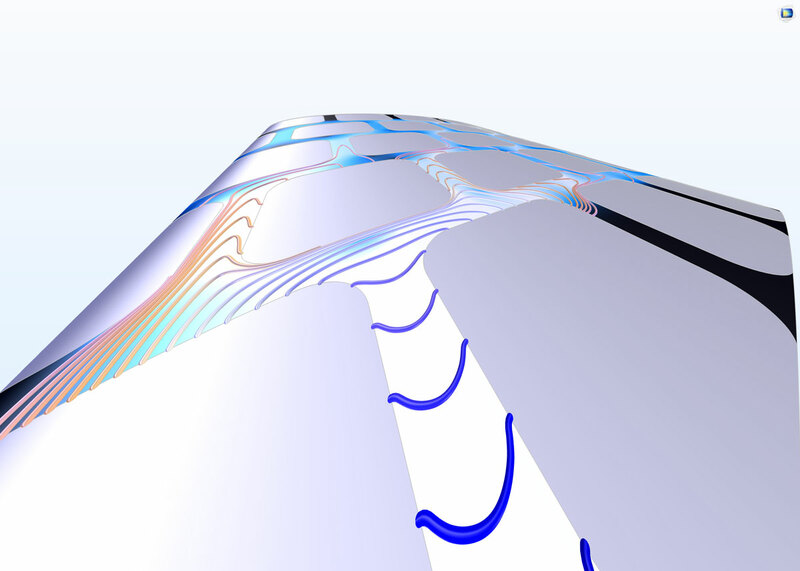 For users of the Chemical Reaction Engineering Module, COMSOL Multiphysics® version 5.3 brings new physics interfaces for modeling reacting flow in porous media, chemical species transport in fractures, charge separation with the Nernst-Planck equations and Poisson equation, and electrophoretic flow. See all of the Chemical Reaction Engineering Module updates in more detail below. Modeling packed beds, monolithic reactors, and other catalytic heterogeneous reactors is substantially simplified with the new Reacting Flow in Porous Media multiphysics interface. This defines the diffusion, convection, migration, and reaction of chemical species for porous media flow, without having to set up separate interfaces and couple them. The multiphysics interface automatically combines all of the couplings and physics interfaces required for the modeling of heterogeneous catalysis together with porous media flow and dilute or concentrated chemical species transport. 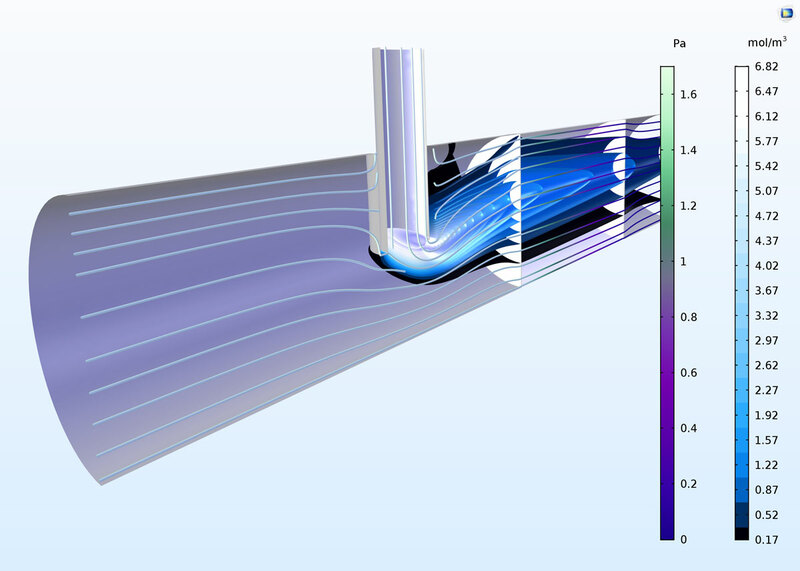 As this multiphysics interface complements similar ones for laminar and turbulent flow, you can switch or define new couplings to other types of flow models without having to redefine and set up a new interface for the participating physical phenomena. 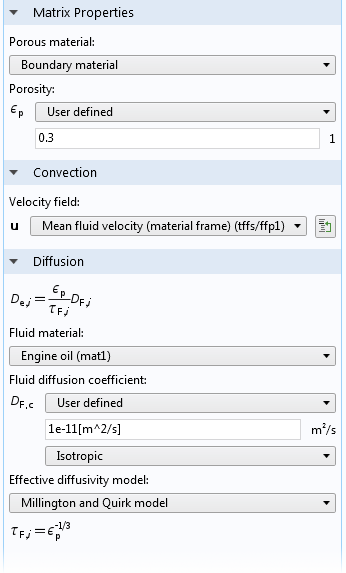 The Settings window allows you to select the type of flow to be modeled as well as the transport of chemical species, without losing any of the defined material properties or reaction kinetics. This means that you can compare different reactor structures or model flow in both free and porous media in one reactor, even when the two regimes are connected (see image). Model of a porous microreactor showing the concentration isosurfaces of a reactant injected through a vertical needle into a free flow containing a second reactant that is then forced through a monolithic catalytic porous media section of the reactor. The model can now be fully defined with the new Reacting Flow in Porous Media multiphysics interface. Fractures have thicknesses that are very small compared to their length and width dimensions. It is often difficult to model the transport of chemical species in such fractures through having to mesh the thickness of the fracture surface, due to the aspect ratios brought about by the large differences in size dimensions. The new Transport of Diluted Species in Fractures interface treats the fracture as a shell, where only the transverse dimensions are meshed as a surface mesh. The interface allows you to define the average fracture thickness, as well as the porosity in cases where the fracture is considered to be a porous structure. For the transport of the chemical species, the interface allows definition of effective diffusivity models to include the effects of porosity. 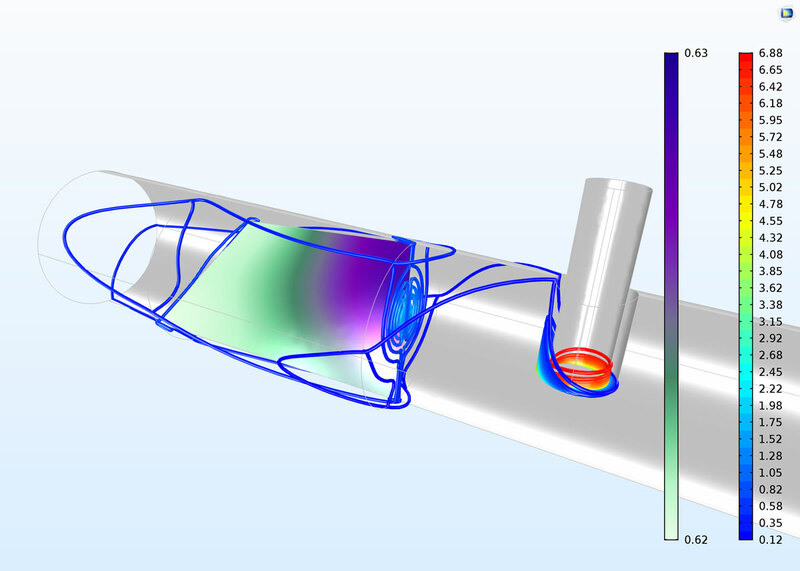 Convective transport can be coupled to a Thin-Film Flow interface or through including your own equations to define fluid flow through the fracture. Additionally, chemical reactions can be defined to occur within the fractures, at its surfaces, or in a porous medium that encompasses the fracture. Transport of diluted species along a slightly curved fracture surface. The curved surface consists of an imprinted tortuous path through the surface where flow and chemical species transport occur. Transport of diluted species along a slightly curved fracture surface. The curved surface consists of an imprinted tortuous path through the surface where flow and chemical species transport occur. 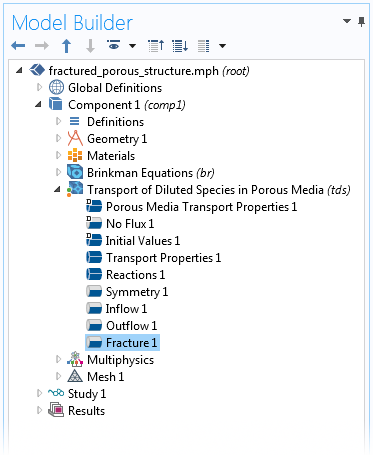 In cases where transport occurs in a fractured, porous 3D structure, the new Fracture boundary condition lets you model transport in the thin fractures without having to mesh them as 3D entities. The Fracture boundary condition is included in the Transport of Diluted Species in Porous Media interface (see image) and has the same settings as in the Transport of Diluted Species in Fractures interface (described above). Fluid flow and chemical species transport are seamlessly coupled between a 3D porous media structure and fluid flow and chemical species transport in a fracture. 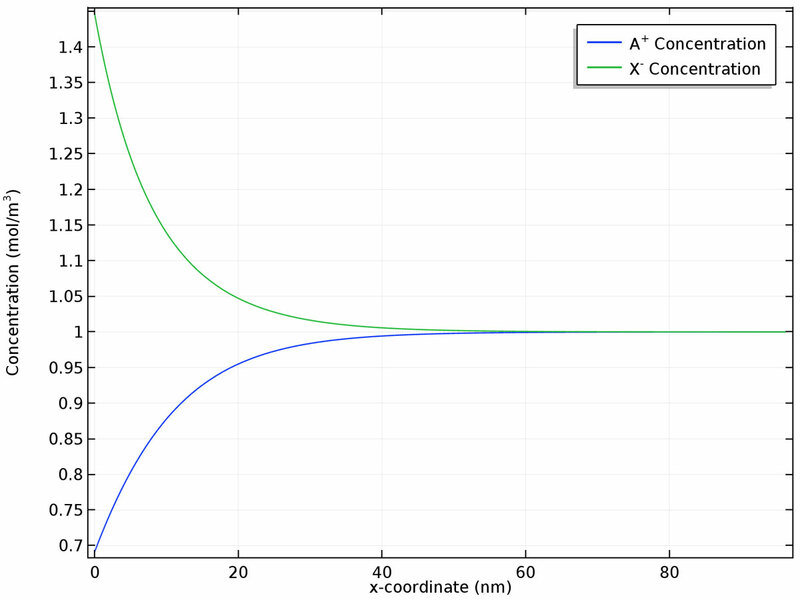 The image below shows the concentration field in a porous reactor model. In the model, a twisted fracture "leaks" reactants deeper into the porous catalyst, from left to right, at a faster rate than the transport through the porous media. This is because the fracture surface has a much higher average porosity compared to the surrounding porous catalyst, which gives a higher mass transport rate. Concentration contours through the 3D reactor and surface concentration in the fracture surface. The higher mass transport rate in the fracture surface gives a larger penetration (from right to left) of unreacted species into the catalyst bed. We can see that the change in concentration from right to left is very small in the fracture surface (from 0.63 to 0.62 mol/m3). Concentration contours through the 3D reactor and surface concentration in the fracture surface. The higher mass transport rate in the fracture surface gives a larger penetration (from right to left) of unreacted species into the catalyst bed. We can see that the change in concentration from right to left is very small in the fracture surface (from 0.63 to 0.62 mol/m3). The user interface for defining thermodynamic functions and Property Packages from CAPE-OPEN compliant databases has been streamlined so that it is easier and more transparent to link the Chemical Reaction Engineering Module to external databases. The transport of ions in electrolytes subjected to electric fields is driven by diffusion, migration, and convection, which are described by the Nernst-Planck equations. In the cases where the electric field is large, it is possible to obtain charge separation (deviation from electroneutrality) locally in the electrolyte, for example close to metal or ceramic surfaces. Charge separation can be modeled with the Nernst-Planck equations in combination with the Poisson equation for charge conservation. 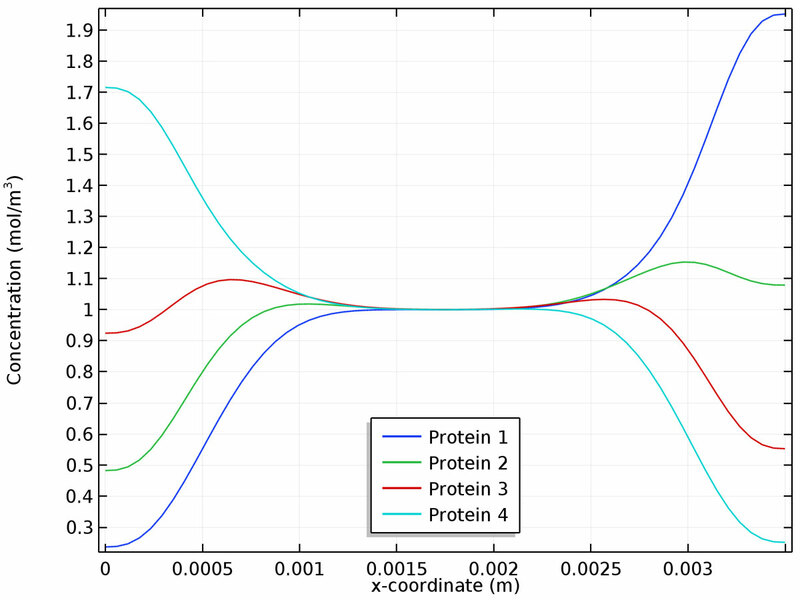 The latest version of the Chemical Reaction Engineering Module contains the new Nernst-Planck-Poisson Equations interface for modeling these types of systems. The new Electrophoretic Transport interface can be used to investigate the transport of weak acids, bases, and ampholytes in aqueous solvents. The physics interface is typically used to model various electrophoresis modes, such as zone electrophoresis, isothachophoresis, isoelectric focusing, and moving boundary electrophoresis, but is applicable to any aqueous system involving multiple acid-base equilibria. Zone electrophoresis separating a mixed sample of two proteins into two well-resolved concentration peaks. This tutorial serves as an introduction to the Electrophoretic Transport interface. A zone electrophoresis problem is set up for separation of a sample containing aniline and pyridine. This example applies the Electrophoretic Transport and Laminar Flow interfaces to model isoelectric separation in a free-flow electrophoresis device. A stream containing four different proteins separates into concentrated streams by means of migrative transport in an electric field.